Thanks again to my guest reviewer from yesterday, Beer Pancakes. And good timing, too, with IHOP holding their Fifth Annual National Pancake Day today. If this dude got himself out of bed in time today, he'd have been able to get himself some freebies. Anyway, I took a break yesterday. Did everyone see the US beat Canada on Sunday night in ice hockey? Was the first time in probably forever (or at least since the last Olympics) that I liked both a New York Rangers player (Chris Drury) and New Jersey Devils player (Jamie Langenbrunner) in the same day! The stars were aligned, and it was sweet to upset Canada in their beloved sport in Canada in the Olympics! We'll see what happens from here. Rematch? Also on Sunday, when I was flipping through the channels, I caught Space Shuttle Endeavor landing around 10:20 PM at Kennedy Space Center. Was cool! But WTF? They were saying there will only be four more space shuttle missions before they retire the whole fleet? What is going on? 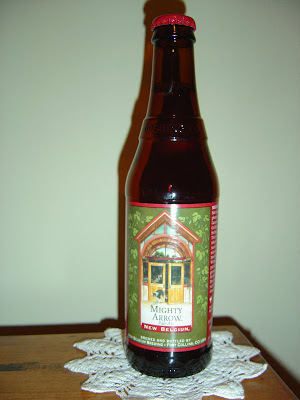 Tonight I'm drinking Mighty Arrow Pale Ale brewed by New Belgium Brewing Company in Fort Collins, Colorado. This came home from a colleague's recent business trip in Houston. Thanks again! Arrow is the name of a New Belgium pet dog that used to roam the brewery grounds. There is a picture of her on the label. Best Before June 4, 2010. Sweet aroma, with fruity orange and citrus. The flavors start out slightly hoppy with a bit of sweet fruit mixed in. Then citrus and some lemon and orange step in before a malty base balances things out. Medium body and carbonation are spot on. By the end, the beer is lightly bitter, and you finish clean and dry. A citrus aftertaste is left behind on your palate an you will feel refreshed. Nice beer that I would drink again today if these made it down my way. If available, check it out!